Parker's Crown Bumper System is a patented energy management system. It has been designed to replace existing bumpers that are often made from wood and found on drilling rigs. 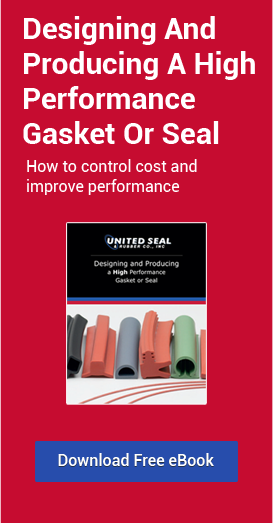 United Seal & Rubber is proud to offer this product because it reduces down time, reduces the risk of damage and offers our customers ease of installation. We realize that downtime can cost rigs a lot of money. All three of the previous mentioned features of this Crown Bumper System are intended to reduce downtime and help the oil rigs make money. Instead of the wooden design, Parker designed these bumpers out of special rubber compounds. These rubber bumper pads can absorb up to 60% of the kinetic energy created by a post breaking bump of the crown by the traveling blocks. The system has been tested to withstand a 25,000 Ib bump at 3.68 ft. per second with no permanent deflection. They were also tested to withstand a 56,000 Ib. bump at 2.94 ft. per second with only 1/8" permanent deflection. It is recommended that bumper pads are replaced every 3 - 5 years or when they show signs of needing to be replaced. Aside from looking for cracks or other visual signs of damage, recommended inspections (annual at a minimum) include: Looking for rusty or cracked welds * Cracks or deterioration of rubber * Bolts, nuts & cotter pins - check for rust, bent or missing * Wire Rope - check that clamps are tight, no cuts or kinks and for rust. Recommended post - impact inspection includes: Bent tubing * Bent bolts * Pieces of rubber missing * Cracks in welds * Wire Rope - check that clamps are tight, no cuts or kinks and for rust. United Seal & Rubber is proud to offer Parker's Crown Bumper Systems for Drilling Rigs. For Crown Bumper Installation recommendations, please visit our website at: ttp://www.unitedseal.com/gasket-maker/item/crown-bumpers-wooden-bumper-replacements-, look under the resource tab for a complete Parker brochure that describes Crown Bumper Installation tips.